Radio Free Europe (RFE) correspondence with anonymous sources from behind the Iron Curtain. This item was transmitted from the Istanbul field office. 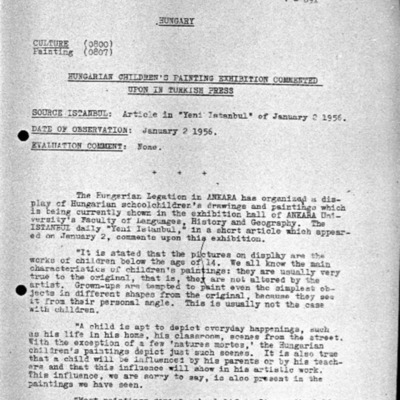 Radio Free Europe/Radio Liberty Research Institute (RFE/RL Research Institute), “Hungarian Children's Painting Exhibition Commented Upon IN Turkish Press,” <1956> Digitális gyűjtemény, accessed 2019. április 25., http://1956.osaarchivum.org/document/fe51162a-6444-4ddf-a03a-cce0299c1a75.